Executive Chef Rasmus Møller Nielsen of SALT Bar-Restaurant in Copenhagen, Denmark shares his exciting recipes. 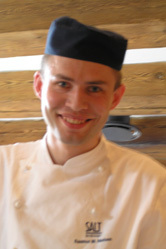 Rasmus Møller Nielsen joined SALT Bar-Restaurant in 2003, where he began working as a Sous Chef before advancing to his present position of Executive Chef. Before coming to SALT Bar-Restaurant he worked at the Copenhagen restaurant, Pierre André. SALT Bar-Restaurant is a stylish restaurant housed in a 1787 landmark building that once was a warehouse for salt, of course! This month, Chef Rasmus shares his innovative recipes for Fried Garfish and Norway Lobster with Polenta Crème, as well as Ramson and Roasted Corn Cockerel with Preserved Rhubarb, Green Asparagus and Vichyssoise Foam. Boil the maize with chicken stock to make a smooth polenta and season to taste with grated Parmesan cheese, olive oil, salt and pepper. (The polenta is made from approximately 1 part grain to 4 parts of stock). Brown the lobster shells with chopped onion, carrot, garlic, thyme and one bay leaf. Add white wine and water and boil slowly for 20 minutes to reduce the liquid. When it is reduced to 1/3, strain the liquid and thicken into gravy with agar agar (agar agar is a thickening agent, cornstarch may be substituted) use 1,5 grams (0.05 ounce) of agar agar to 1 dl (3.5 ounces) of soup. The thickened gravy is then cut into julienne. The garfish fillets are portioned and fried skin side down before serving. The Norway lobster tails are lightly mixed with paper-thin slices of lardo or other type of lard, and are warmed in the oven before serving. Blend ⅓ of the ramson and ⅓ of the parsley with warm olive oil. The mixture should be completely smooth before it is passed through a sieve. The oil is mixed with egg whites at a ratio of 1:10 and poured in a siphon bottle to create the chiffon. 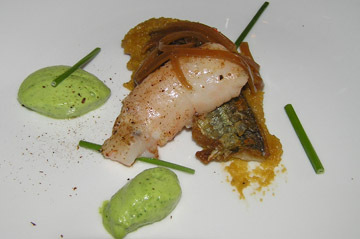 Place the fried garfish with the Norway lobster on a spoonful of polenta and serve with Norway Lobster gravy, ramson chiffon and chopped chives. The cockerel is cut into breast and legs. Roast the breast with the bones, (serve ½ a breast per person.) Salt the legs and confit in duck fat. Steam the green asparagus (3 per person) with butter, chopped shallots, salt and pepper. Boil the new potatoes with lovage, mash coarsely and mix with olive oil, chopped parsley, salt and pepper. Press into shape and bake in the oven before serving. Cut the rhubarb into small pieces. Quickly mix the rhubarb with sugar, vanilla and lemon to make a compote. Brown the cockerel carcass in a pot with onion, leek, carrot and thyme. Reduce the juice with white wine and boil for a couple of hours with water. Strain the stock through a cloth and reduce to a gravy consistency, taste, add butter and lemon juice, and season with salt and pepper. Sauté one potato and one leek (white) in butter with a bay leaf and a sprig of thyme. Boil with a little chicken stock until tender. Blend until smooth and pass it through a sieve; add a little cream and season with lemon juice, salt and pepper, and blend to a foam before serving. Use part of the leg meat and mix with a salad of parsley, finely chopped rhubarb, and peeled cucumber that has been julienne sliced and pickled in vinegar and sugar. 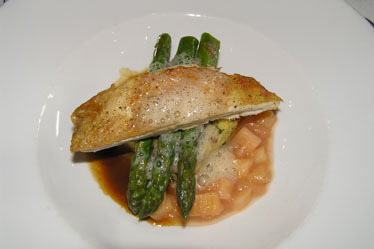 Read our other articles on SALT Bar-Restaurant in the Restaurants section.